Our History | Massachusetts Tree Wardens and Foresters Assn. Massachusetts law states that every community must have a tree warden. The original law passed in 1899 and is still in effect today. The Massachusetts Tree Wardens’ and Foresters’ Association was organized not long after, in 1913. From the earliest days of the profession, arborists were aware that tree care is constantly changing. As early as 1894, Dr. George E. Stone of the Massachusetts Agricultural College (now the University of Massachusetts) gave a course of college lectures dealing with shade tree management. Recognizing that a practicing tree warden also needs current technical information, Dr. Stone established the first short course for professionals. A special school of instruction for tree wardens took place at the Amherst campus on March 26 and 27, 1913. On the second day of the short course, largely through the efforts of Dr. Stone, about twenty-five course attendees organized the Massachusetts Tree Wardens’ and Foresters’ Association. 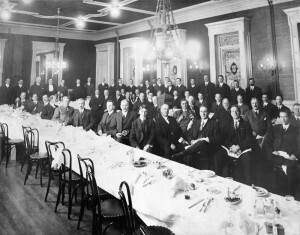 The new association held its second meeting at the State House in Boston on August 22, 1913, with President Stone as chair. The program was typical of many more to follow, with speakers on control of gypsy and brown-tail moth and on forestry practices and management. Leopard moth and chestnut blight were rampant at the time, and there were speakers on these subjects as well. All who attended these first two meetings signed a charter members list and adopted a constitution. MTWFA planted a commemorative elm tree in 1942 on the UMass Campus in honor of Dr. Stone. A recently discovered historical note: In 1951 MTWFA sponsored the winner of the first national tree climbing competition, Joe Arsenault. The September article reported that he was sponsored by the Massachusetts Arborists Association, but a correction published the following month identified MTWFA as the correct sponsor. Fast forward to 2013, when the MTWFA celebrated the one hundredth anniversary and published a book, The Centennial Year: 1913–2013. The centennial book builds on history first assembled in the Fiftieth Anniversary Edition published in1963. To purchase a copy of The Centennial Year: 1913–2013 ($35 cost, includes shipping), email an order to the association at info@masstreewardens. With these histories, the MTWFA proudly acknowledges all tree wardens and their supporters—past, present, and those yet to come – for their contributions to the care of trees and their service to their communities.